At a meeting of the Portadown Technical Committee on Thursday, 12 March 1914, Technical School principal J. G. Edwards reported that certain pupils attributed their poor attendance to “the picture house” and “drilling” (“Technical School Drilling”). Like the nationalist boys who had objected to the British Army Film in Dublin the previous week – although opposed to them politically – the unionist boys of Portadown were culturally and politically active, participating in the Ulster Volunteer Force’s (UVF’s) increasingly visible campaign of opposition to Home Rule. For a significant number of young Irish men of different political convictions in 1914, the cinema and marching formed part of the texture of their lives. Publicity still for The Shaughraun from the Irish Film Archive (http://irishamerica.com/2011/12/blazing-the-trail-to-ireland/22-the-shaughraun-publicity-still/). 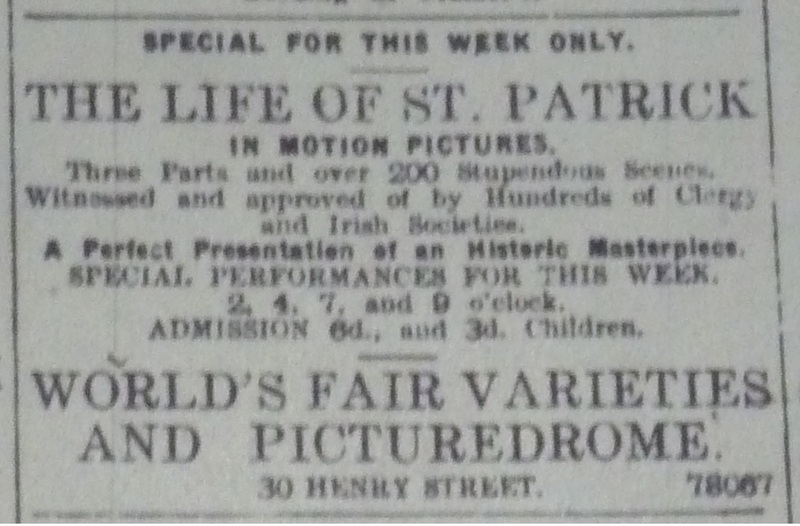 Despite the polarization of Irish politics by the growing Home Rule crisis in March 1914, the celebration of St. Patrick’s Day in the country’s cinemas appears to have been surprisingly uncontroversial. 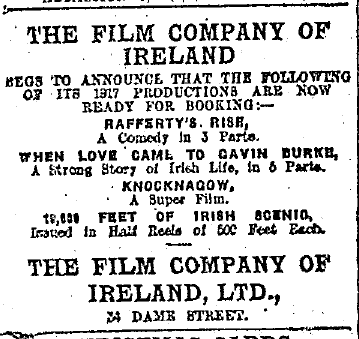 Several cinemas in the largest population centres of Dublin, Belfast and Cork chose Irish-themed films, with Irish-shot films – especially those of the Kalem company – being particularly favoured. 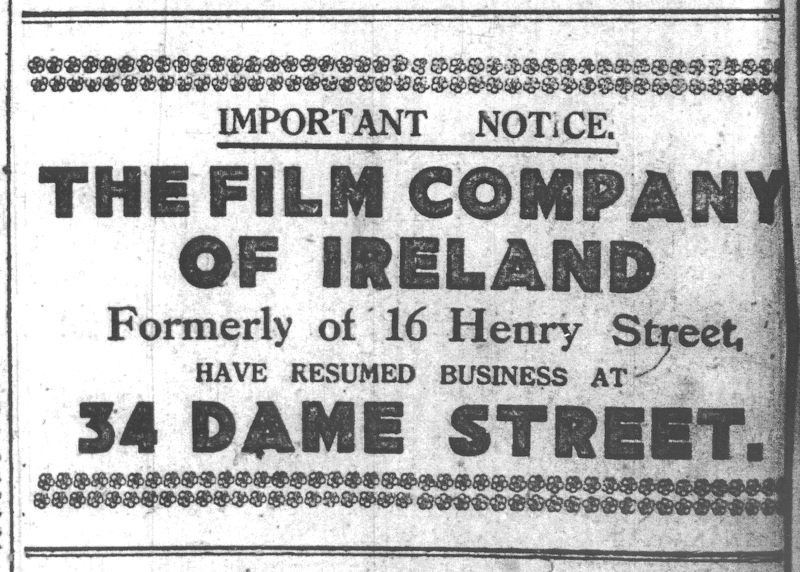 Indeed, it would be decades before so many recently produced Irish-shot film would be available to celebrate St. Patrick’s Day. 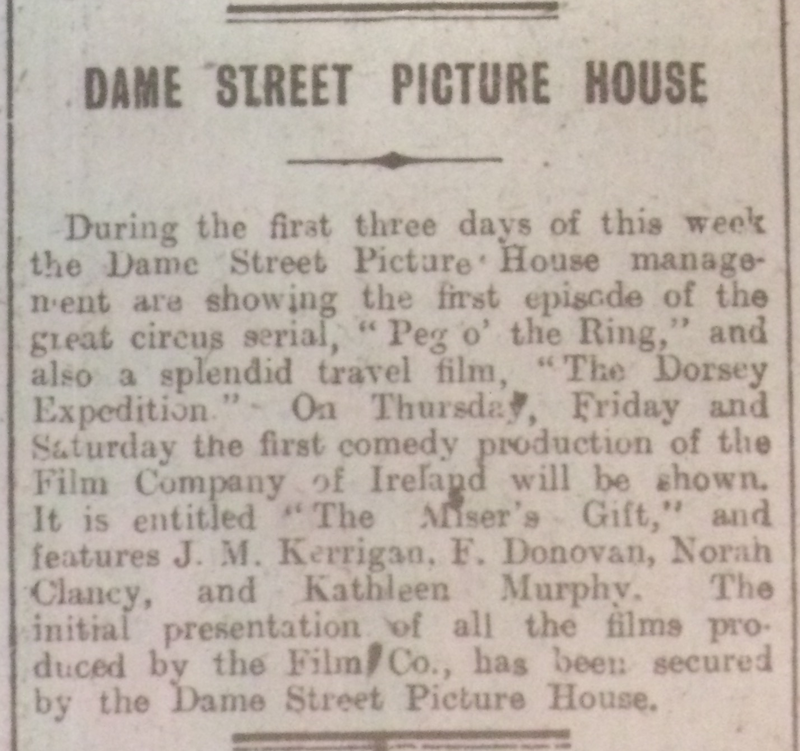 For St. Patrick’s night only, Dublin’s Phoenix Picture Palace showed The Shaughraun (US: Kalem, 1912); the Clonard Picture House in Belfast’s Fall’s Road offered the same film but for the more usual three-day run beginning on 19 March. In Cork, the Coliseum exhibited Kalem’s The Kerry Gow (1912). The Cork Constitution‘s review of the latter appears to come from a non-Irish source as it explained that “The Kerry Gow (a blacksmith) is a splendid Irish production, which was acted in the Green Isle, and features Jack Clarke and Gene Gauntier, with a full company of ‘flicker’ artists of repute” (“The Coliseum”). Evening Telegraph 16 Mar. 1914: 4. Of even more direct relevance to the feast day of the Irish patron saint was J. Theobald Walsh’s Life of Saint Patrick: from the Cradle to the Grave (US: Photo-Historic, 1912). 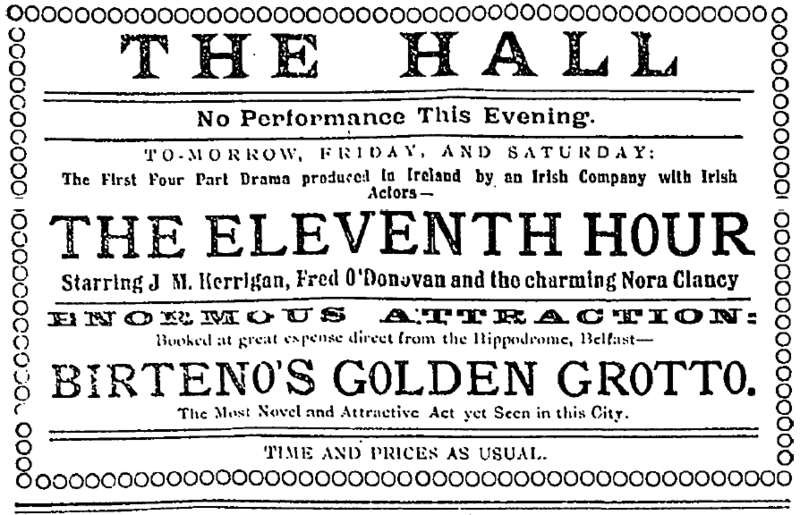 This film was shown in Patrick’s Week at Dublin’s World’s Fair Varieties in Henry Street. This was not the first time the World’s Fair had shown the film; the venue began 1914 with an extended run of it. It was “over 3,000 feet long [and] was produced by Theobald Walsh, for the Photo-Historic Company, New York, on the actual spots made memorable by Ireland’s Apostle. It is enacted throughout by Irish peasants attired in the correct costumes of that period” (“World’s Fair Varieties”). It was, one reviewer commented, a “splendid picture, and most appropriate for the time of year it is.” Indeed, “it is, undoubtedly, a most masterly film” (“’Life of St. Patrick’”). Bioscope ad for Solax’s Dublin Dan (12 Jun. 1913: 830). Elsewhere, Irish-set (but not -shot) films or those featuring Irish characters that – like the Kalem films and The Life of Saint Patrick – had been released in the previous year or so were revived for the occasion. For the first part of Patrick’s week, the Clonard showed The Banshee (US: Kay-Bee, 1913), a “splendid two-part drama” to whose representations of the Irish the Ancient Order of Hibernians had objected when it had been shown in Tralee, Co, Kerry, in early February 1914 (Condon). Other titles were more Irish-American than Irish. 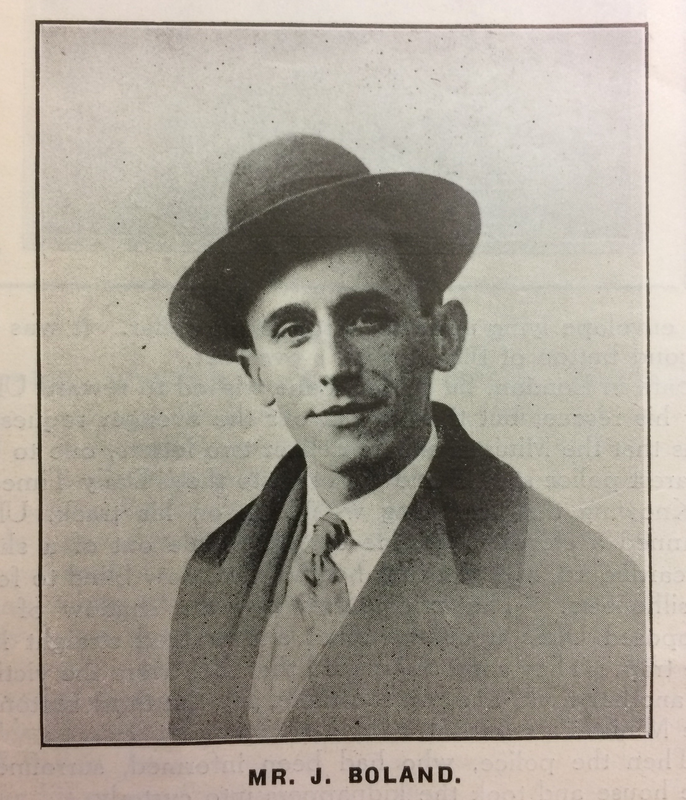 As part of its special Sunday programme on 15 March, the Phoenix showed Solax’s Dublin Dan: The Irish Detective (1912), which starred popular stage actor Barney Gilmore in his first film. In an ad for the film in a US trade journal, Solax described Gilmore as the “popular American and Irish idol – the matinee girl’s pet – the favorite of millions, an actor known in every state in the Union – a veteran on the stage – although young in years, with a personality that ‘comes across’” (Solax 729). 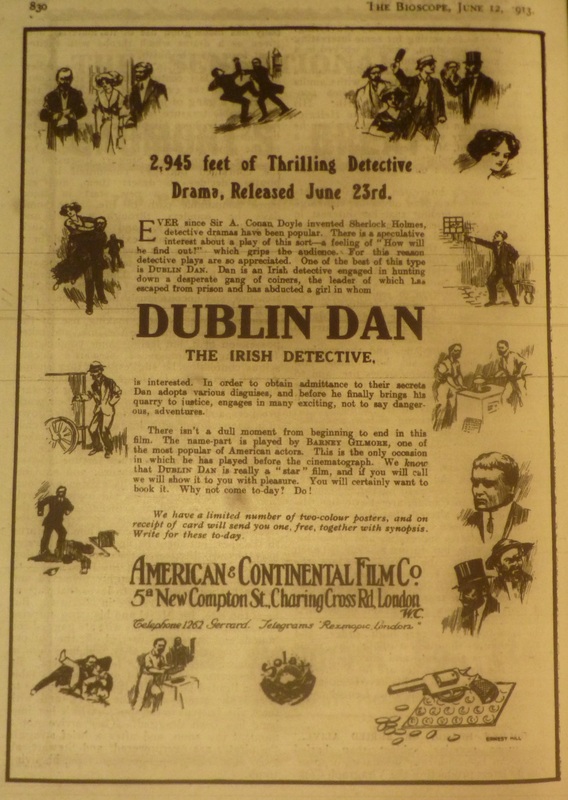 Although The Escape of Jim Dolan (US: Selig Polyscope, 1913) contained a temptingly Irish-named protagonist, this Tom Mix Western at the Picture House in Dublin’s Sackville/O’Connell Street for the three days including St. Patrick’s Day appears to have had no meaningful Irish or Irish-American theme beyond that name. Dublin Evening Mail 18 Mar. 1914: 2. Two films of actual sporting and political events in Ireland were also popular. On Monday, 16 March, films of two international football matches that took place in Belfast the previous weekend were exhibited at several picture houses, including the West Belfast Picture Theatre on the Falls Road – which showed the soccer match at Windsor Park between Ireland and Scotland – and the Picture House, Sackville/O’Connell Street – which showed the Ireland v. Wales rugby match at the Balmoral show grounds. On 19 March, the Princess Cinema in the Dublin suburb of Rathmines was the first in the city to show the film “Trooping the Colours” that had been shot by Pathé at Dublin Castle on St. Patrick’s Day. A military display overseen by the Lord Lieutenant in the presence of invited dignitaries, this film offered moving-picture evidence of a phenomenon that had long been clear in other media: that St. Patrick’s Day was an established part of the official culture of British-ruled Ireland. Ads for Belfast’s Panopticon on 19, 21 and 23 Mar. 1914. Actuality films shown in Belfast presented a very different view of Ireland in 1914. As debates on special terms for the exclusions of parts of Ulster from a home-ruled Ireland continued at Westminster, the Panopticon in High Street topped its bills in the second half of Patrick’s week with films that showed the determination of unionist resistance. An actuality of the South Antrim brigade of the UVF was screened from 19 March in answer to the question posed by newspaper ads for the show: Are the Ulster Volunteers Prepared to Fight? This question had gained increased currency that day, when Edward Carson abruptly left Westminster in the face of insufficient concessions for Ulster, stating his intention of confronting what would come with his people. On Saturday, the South Antrim brigade film was joined on the Panopticon bill by The Arrival of Sir E. Carson, a film that was retained into the following week, although the new programme was headed by Asta Nielsen’s Up to Her Tricks (Engelein; Germany: Projections-AG Union, 1914). By then the political crisis in Ireland had worsened with the beginning of the Curragh Mutiny, the declaration by British Army officers in Ireland that they would not move against the UVF. The value of crowdsourcing the news: Belfast Evening Telegraph 9 Mar. 1914: 5 and 6 Mar. 1914: 2. How important the films at the Panopticon were in propagating resistance to Home Rule is difficult to say, but the value of still images to the campaign is clear from the Belfast Evening Telegraph. 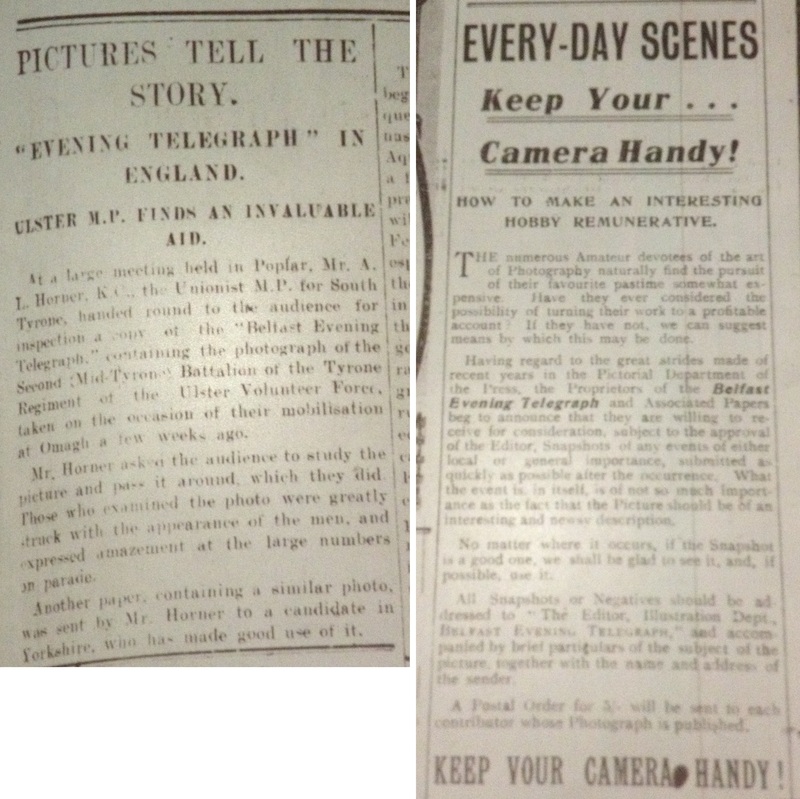 In early 1914, the Telegraph had been encouraging the amateur photographers among its readers to send in photos of newsworthy events for possible publication. The paper carried a large number of professionally produced photographs, drawings and illustrated ads, and this crowdsourcing of photographs enhanced what was already probably Ireland’s most visually rich newspaper. The usefulness of such images to unionism was made explicit by the 9 March article “Pictures Tell the Story,” which relates how at a meeting in London, Unionist MP Andrew L. Horner distributed a Telegraph photo of a UVF battalion that amazed the audience with the numbers on parade. The method of dissemination here was crude but effective and repeatable: “Mr. Horner asked the audience to study the picture and pass it around, which they did […] Another paper, containing a similar photo, was sent by Mr. Horner to a candidate in Yorkshire, who has made good use of it” (“Pictures Tell the Story”). In this context, the usefulness of moving pictures in showing sympathetic audiences in Britain the extent of unionist opposition to Home Rule seems obvious, but a system of distribution that allowed the correct contextualizing of the films was required. By June 1914, the full value of moving images of Ulster resistance would be realized when the Union Defence League fitted out four large vans with projectors, screens and films of Carson and the UVF to tour Britain spreading the message of opposition to Home Rule (Paddy, 18 Jun.). Already by March 1914, however, young supporters of the UVF were finding their drilling and cinema-going converging. “The Coliseum: A Strong Programme.” Cork Constitution 17 Mar. 1914: 6. Condon, Denis. “Limelight on the Colleen Bawn: Resisting Autoexoticism in Provincial Irish Picture Houses in the Early 1910s.” Les cinémas périphériques dans la période des premiers temps. Peripheral Early Cinema: Domitor 2008. Presses Universitaires de Perpignan, pp. 245-255. Paddy. “Pictures in Ireland.” Bioscope 18 Jun. 1914: 1261. “Pictures Tell the Story.” Belfast Evening Telegraph 9 Mar. 1914: 5. 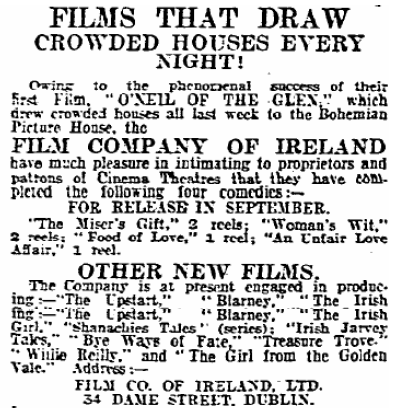 “Princess Cinema, Rathmines.” Dublin Evening Mail 18 Mar. 1914: 2. Solax. Ad for Dublin Dan. Moving Picture World 10 Aug. 1912: 729. “Technical Students Drilling.” Weekly Irish Times 14 Mar. 1914: 6. “World’s Fair Varieties: Life of St. Patrick.” Dublin Evening Mail 16 Mar. 1914: 4. With a large degree of continuity with a century ago, many more people will watch today’s GAA All-Ireland football final at Croke Park between Dublin and Mayo live on television than will attend the game. Despite the Cork’s Evening Echo’s comment in February 1913 (citing an article in Popular Mechanics Magazine) that a “prediction may safely be made that in the near future provision will be made for moving pictures in the home,” live coverage and a kind of domestic moving pictures that suited the event-based nature of sport would still be some 50 years off (“Films for Families”). Nevertheless, Gaelic games’ fans around the country did watch moving pictures of matches in their local picture house days or weeks after they were played. A film of the 1912 Munster Hurling Final between Cork and Tipperary, held at Dungarvan on Sunday, 27 October 1912, was shown at the Assembly Rooms Picturedrome the following Wednesday and then moved on to Limerick and Wexford. Evening Echo 28 Oct. 1912: 2. Unlike today’s game, however, Gaelic games were highly politicized in the 1910s, and the GAA, with branches in every parish in the country was the strongest and most popular nationalist cultural organization. So the gathering of a local audience to watch the film of a game prolonged the demonstration of popular nationalist sentiment that the match itself represented. 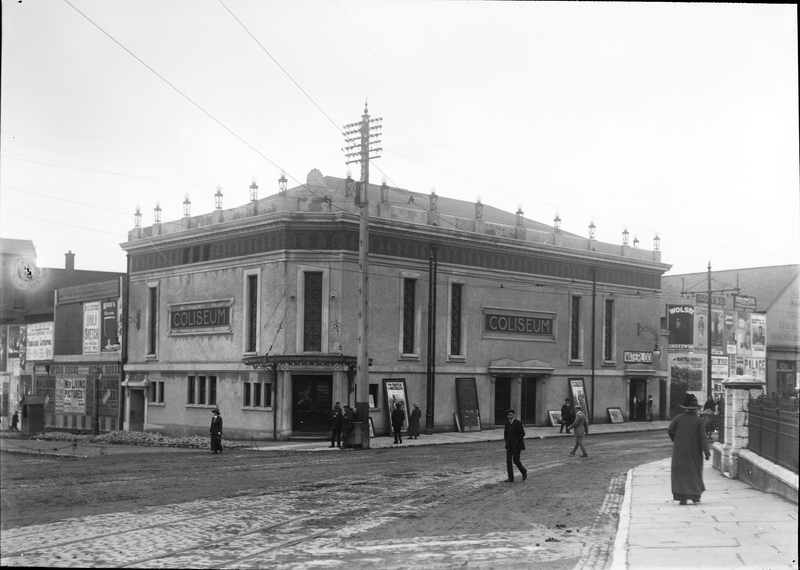 With such a potential audience, GAA matches drew the attention of several local picture house owners, most prominently James T. Jameson – who ran the Rotunda and a circuit of provincial venues – and Alex McEwan, a Cork-based impresario, who operated from the Assembly Rooms Picturedrome. 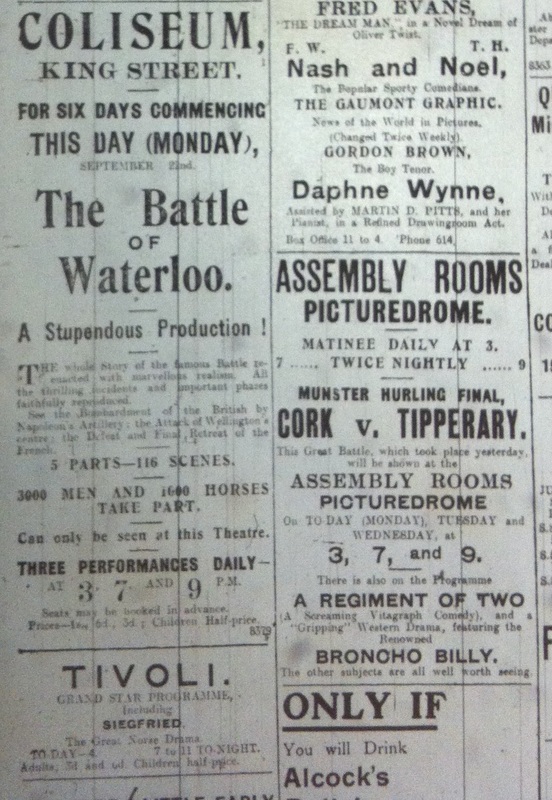 When Cork beat Tipperary at the Munster hurling final in July 1912, McEwan arranged to have it filmed, and the Evening Echo recorded the local interest when he exhibited it beginning the following Wednesday: “[v]iews of every passage of the exciting and scientific contest are shown, and the loud and frequent applause which was heard at intervals during Wednesday night’s performance testified to the great enjoyment that was derived by all present” (“Assembly Rooms, Cork ”). It would travel on to McEwan’s picture house in Limerick and other venues. 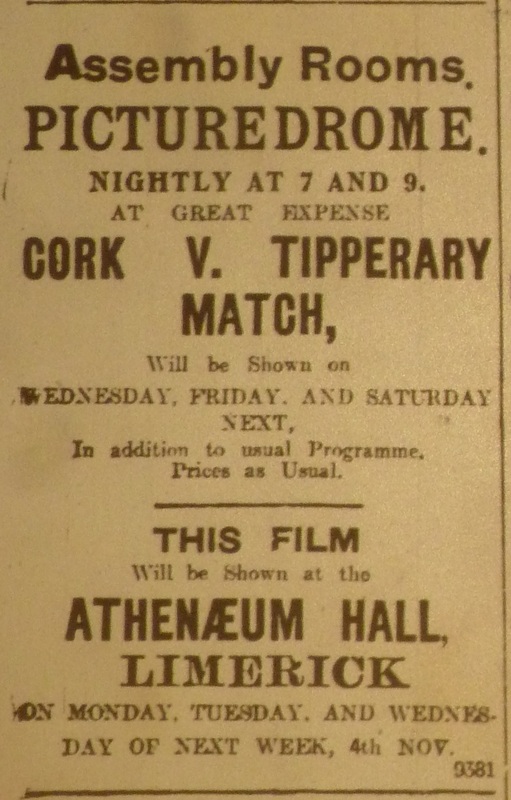 The 1913 film of the Munster hurling final between Cork and Tipperary at the Assembly Rooms Picturedrome had to compete with more moving-picture competition. Cork Examiner 22 Sep. 1913: 4. This week in 1913 saw not the All-Ireland football final, but the Munster hurling final, which again featured Cork and Tipperary and was played at Dungarvan on Sunday, 21 September. Cork fans would have known from word of mouth and newspaper reports that the Cork team did not repeat its success against Tipperary, but they did not have as long to wait for the film to appear on local screens. Given Cork’s involvement and the success of these films seemingly regardless of result, McEwan had arranged to film the match for his local audience and first exhibited it at the Picturedrome beginning at 3pm on the Monday of the week, the afternoon after the match. He also needed a spectacle to compete against the five picture houses that had opened since last he had shown the Munster final, not least the newly opened Coliseum, which was heavily advertising its first exclusive feature, The Battle of Waterloo. On Wednesday evening the members of the Killarney and East Kerry section of the famous Kerry team motored to Tralee to see the moving pictures of the famous match at the Theatre Royal. The motors were kindly lent by Messrs. Green and Casey, whose cars were always at the disposal of the team. The leading followers of the team in Tralee took the opportunity of the visit of the Killarney men to give them a hearty reception after their glorious victory. There was a large and representative gathering, and songs, recitations and toasts were given. As the motors passed through the town they received a tremendous ovation (”The Team at Theatre Royal”). “Assembly Rooms, Cork: Munster Hurling Final.” Evening Echo 34 Oct. 1912: 2. 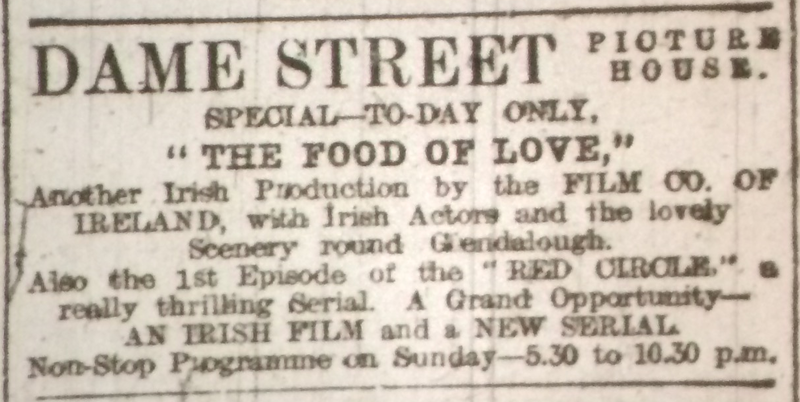 “Films for Families.” Evening Echo 28 Feb. 1913: 2. “The Team at Theatre Royal, Tralee.” Kerryman 5 July 1913: 1. 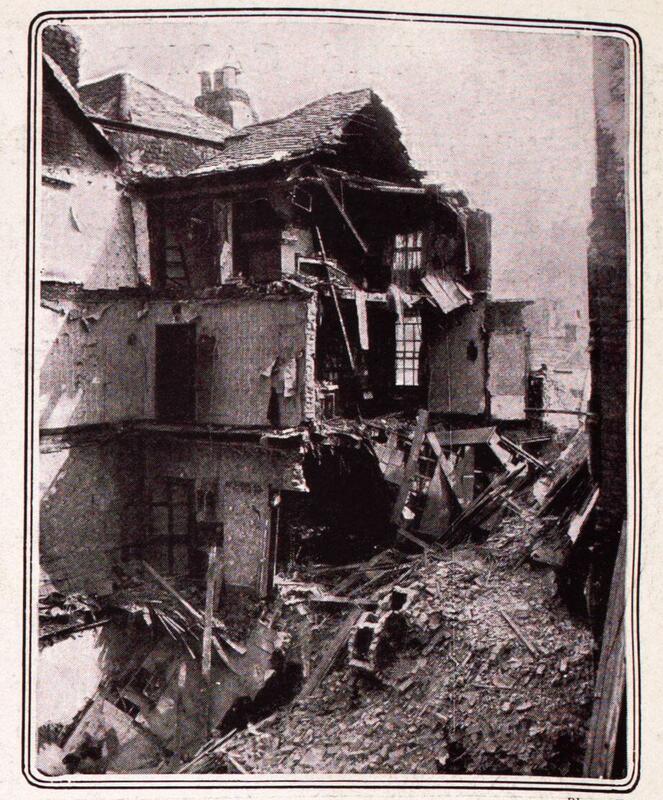 Illustrated London News, 13 September 1913. Tweeted by National Library of Ireland, 2 Sep. 2013 (pic.twitter.com/s2DtgIYSwQ). 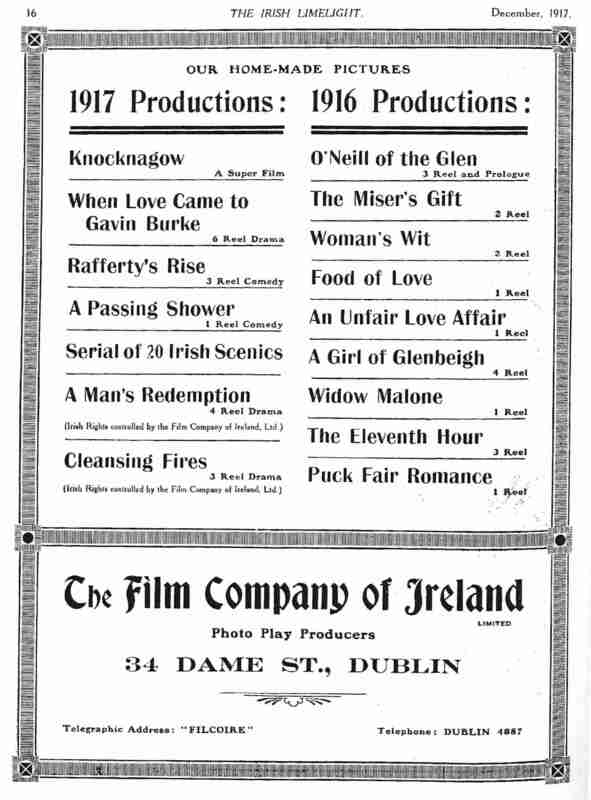 The decision of Dublin picture houses at the end of August 1913 to screen such social events as the Horse Show and the Neptune Rowing Club’s At-Home rather than the iconic opening sorties of the Lockout is indicative of the place that cinema as a cultural institution was coming to occupy in the Irish mediascape. Although not universally true for all picture houses – and as places of employment, some became sites of the ongoing labour disputes – picture houses were businesses owned and managed by men (almost exclusively men) who either already belonged to or who had ambitions to belong to the “respectable” classes. The Phoenix Picture Palace’s activities in relation to the Church Street Disaster in the first week of September 1913 gives some evidence of this. Few events early in the Dublin Lockout better underscore the dire conditions in which many of the city’s workers lived than the Church Street Disaster. These events have been widely written about and will be commemorated this weekend, 6-7 September 2013 by the Stoneybatter and Smithfield People History Project. In brief, at about 8:30 on the evening of 2 September 1913, two tenement houses in Church Street collapsed, killing seven people. The most affecting story to circulate in the aftermath of the collapse was that of 17-year-old Eugene Salmon who saved several members of his family from one of the collapsing buildings but died while attempted to save his sister, Elizabeth. The newspapers were happy to make Salmon the tragic victim of the slums, and Dublin Corporation eventually felt pressured into setting up a Local Government Board inquiry (Nov 1912-Feb 1913) into the housing of the working class (extracts here). Neither the newspapers nor Jim Larkin as the representative of the striking workers made much of the fact that Salmon was a locked-out worker from Jacob’s biscuit factory. This allowed employers, led by newspaper owner William Martin Murphy, to claim solidarity with slum dwellers by condemning living conditions in the tenements, supporting an inquiry and initiating a relief fund for the survivors of the collapse (Corlett). Among the many contributions to the relief fund established by the Freeman’s Journal/Evening Telegraph newspaper group were the proceeds from a benefit night on Tuesday, 9 September at the Phoenix Picture Palace. The Phoenix was located well out of the city centre, on Ellis’s Quay, about 10-minutes walk from Church Street. It was owned by the Phoenix Picture Palace, Limited, who directors were David Frame, Henry Grandy, John MacKay and Andrew Wright (“World of Finance”). When these proprietors reported on the progress of the Phoenix’s construction in July 1912, they projected that its 1,500 seats would mainly be occupied by the working-class residents of the surrounding district (Paddy, 4 July). The rising popularity of cinema would allow such large entertainment venues to operate in residential areas of the city and its suburbs. The proprietors also clearly assumed that as the Phoenix was located on a tramline just minutes from one of the city’s main railway stations, Kingsbridge, they could rely on significant passing trade from travellers using the Great Southern and Western Railway’s lines to and from towns and cities in the south and west. For the benefit night on 9 September, the Phoenix added live acts to the previously booked films, including singers (the “distinguished artistes” Maude Harrington Clancy – a recent Feis Ceoil medal-winner – contralto Madame Gill-Gorevan and baritone Albert Vine Sanderson), humorist Chris Bruton and the “manager of the Phoenix, Mr. Cathal MacGarvey, [who] will also make a re-appearance on the concert platform for this deserving charity” (Church St. Disaster”). The nature of the event and the tone of the newspaper coverage – which made no mention of the films – suggest that this was not designed to bring together the tenement dwellers but rather represented an occasion for a middle-class audience to display their charity. As such, it was successful. A “large audience was present, including several clergymen” (“Dublin and District”), and 353 shillings and sevenpence was donated in the Phoenix’s name to the relief fund (“Freeman-Telegraph Fund”). The Coliseum Cinema, King (now MacCurtain) Street, Cork. National Library of Ireland on Flickr Commons. There was nothing particularly unusual in this; it was how successful business men drew positive attention to the social good their companies represented. In May 1912, the Electric Theatre in Talbot Street – a picture house in which David Frame shared an interest with then-Lord Mayor of Dublin John J. Farrell – had gained publicity by holding a benefit for the Titanic relief fund (Paddy, 30 May). For Frame and his partners in the Phoenix, the social respectability that came from the benefit for the Church Street victims was timely. Indeed, the 9 September was a big day for this group of businessmen, whose newest venture, the Coliseum in Cork, also opened on that day. “Church St. Disaster.” Evening Herald 5 Sep 1913: 5. Corlett, Chris. “The Church Street Disaster, September 1913.” History Ireland 17:2 (Mar-Apr 2009). “Dublin and District: Aid for the Church Street Sufferers.” Irish Independent 10 Sep. 1913: 5. “Freeman-Telegraph Fund.” Freeman’s Journal 12 Sep. 1913: 7. Paddy. “Pictures in Ireland.” Bioscope 30 May 1912: 639; 4 July 1912: 25.